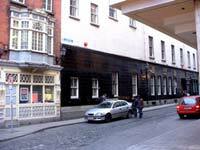 Blooms Hotel is a lively city centre hotel, located in the historic Temple Bar area, the hub of the city's nightlife and cultural activity. All bedrooms are en suite with extras such as a garment press, hairdryer, direct dial telephone and TV. The hotel has it's own nightclub and is located close to all major shops, theatres, restaurants, art galleries and museums. The 86 ensuite bedrooms have been tastefully decorated to reflect the high standards of this hotel. All rooms offer the following: Full ensuite, Telephone, Television, Room Service, Hairdryer, Wake-up calls, All floors are served by elevator, Full Licensed Bar with Live Music, daily, Night Club, Residents Bar. Dining at Blooms can be an enjoyable and inspired experience. Lunch, pre-theatre meals and evening meals are now served in our new dining room. The menu features traditional and classic dishes - and is complimented by a selection of lighter meals and snacks available throughout the day. The recently refurbished Vat House Bar is a lively and popular haunt of tourists and locals alike, particularly at weekends when live music is often available. Downstairs, the well-known Club M niteclub is open 7 nights a week. Blooms is conveniently located to both DART stations and bus stops. Car parking is also immediately at hand. The staff at Blooms Hotel want you to enjoy your visit. We are delighted to offer you as much assistance and information as we can on tours and sightseeing venues within the city.